To have any future, it is essential at-least that you view it from the present tense. Industrial revolution following the colonial occupation and followed by the Communist revolutions in reaction was another era that has been passed as Industrial Age. Thereafter the Internet Age has duly begun independently. Calling this the fourth industrial revolution is an understatement by the people left in the past, who are still busy learning English and installing computers. Persisting with such old lessons make them perceive their future from the past tense but to no avail, as they have finally lost it. To not be at fault like that simply synchronise your sense of future with Sangkrit. Ongoing digital developments have built the threshold of entirely different another era. We are not in the industrial age anymore. Just like the green revolution did not occur in the agrarian age. 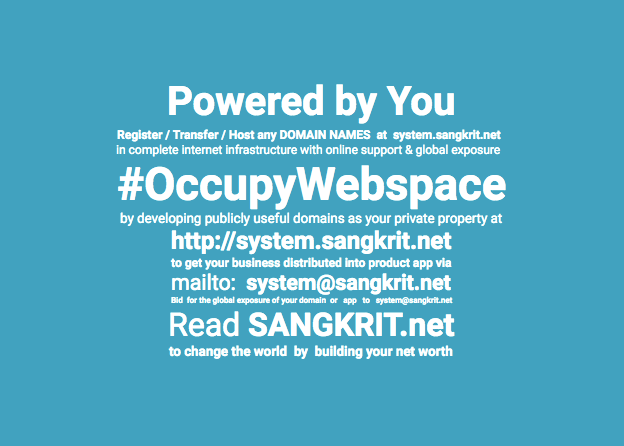 Sangkrit’s entry point protocol begins as empty pocket entrepreneurship into internet startups. That is made explicit in Hindi in a power pamphlet made available for free at the google play. Educating in english has become outdated like installing computers were primitive things done till the early stage of internet age and these endeavours have ultimately lost worth with the beginning of the smartphone stage of internet age. Continuing with such old habits is like perceiving future from the past tense. To have any future, it is essential at least that you view it from the present tense.